The edges of this tile are painted to match the painting and it will be mounted to a linen textured art board which is painted black. The tile will come sealed and varnish protected. There will be no glass. 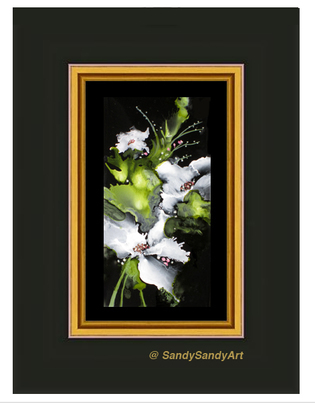 The profile of this frame and the overall impression is very striking. This tile is 3 x 6" and the elegant black and gold frame is 5 x 8" with an overall outside dimension of 9 x 12". It comes ready to hang. See an actual photo of the frame profile and other available black tiles here. $199. indicates sold - Want something similar in a different size or color scheme?